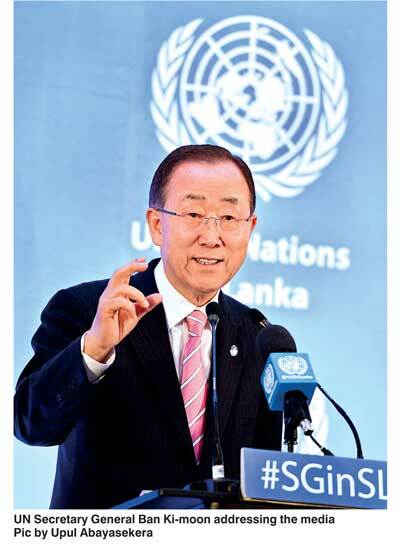 Extending warm praise to the Government’s efforts to foster reconciliation, United Nations Secretary General Ban Ki-moon yesterday nonetheless backed infusion of foreign expertise into Sri Lanka’s transitional justice process to bring closure to thousands affected by the three decade war. Ban, on a three-day official visit, praised the efforts of President Maithripala Sirisena’s administration since coming to power last year to address some rights abuses committed during the war. Over the past year the new Sri Lankan Government has worked to release land to original Tamil owners, reduce militarisation in the former war-torn north and pass legislation to begin investigations into thousands of people who disappeared during the conflict. “I commend the Unity Government for taking steps to pursue truth seeking and accountability to deal with grievances from the people in the north and east. These are positive steps, but more needs to be done. Victims cannot wait forever, they deserve to have their voices heard, and they deserve credible transparent transitional justice mechanisms,” he told reporters at a press briefing before winding up his visit on Friday. While acknowledging that promoting reconciliation would primarily be a function of the Sri Lankan Government, Ban stressed that transitional justice, which was a key component of the resolution Sri Lanka adopted at the United Nations Human Rights Council (UNHRC), would be best served with involvement of the international community as it would provide more credibility. Peace building, the third pillar, would also have support from the UN and other international community stakeholders, he added. “Transitional justice: There, I think we have to work with the international community, with the Human Rights Council having adopted a resolution last year recommending the Sri Lankan Government establish a credible transitional justice system. Credible, both nationally and internationally,” he noted in response to questions. The Secretary General also called on the Government to deepen efforts to strengthen institutions such as the judiciary and security services and return land in the north. Ban also touched on the “Report of the Secretary-General’s Internal Review Panel on United Nations Actions in Sri Lanka,” which was convened by him in 2010 as a response to widespread criticism over the UN’s underperformance during the last stages of the conflict in 2009. The report found widespread bottlenecks and lack of expertise in the functioning of the UN officials in Colombo at the time and their engagement with the Sri Lankan Government. The report had triggered “deep reflection” of the UN, revealed Ban, prompting it to become the base of subsequent efforts by the UN in war zones around the world where human rights “was returned to the core” of humanitarian operations. Ban also vehemently denied accusations of double standards in its treatment of allegations against Sri Lanka, saying the UN follows “one charter, one declaration,” for everyone. The Secretary General met with members of the Tamil National Alliance (TNA) during his brief visit to Jaffna. Hundreds of family members of people who had disappeared during the war demonstrated outside the Jaffna Library seeking UN intervention to find their missing loved ones and calling for more accountability from the Government. President Maithripala Sirisena yesterday described his meeting with UN General Secretary Ban Ki-moon on Thursday as being very positive, with the latter assuring fullest support for the reconciliation process. Briefing editors and media owners yesterday, the President said he explained the steps taken to strengthen democracy through the 19th Amendment to the Constitution and the establishment of Constitutional Council and Commissions. He also briefed about the reconciliation process, return of land in the north to original owners, resettlement, rehabilitation and development. Ban Ki-moon expressed his appreciation over the progress made by the Government and assured fullest cooperation and assistance to the Government for carrying out these tasks, he said. “The UN Secretary General’s smiling face, when he expressed his appreciation, is a glowing reflection of the United Nation’s goodwill towards Sri Lanka,” the President said. The President added that the Government’s intention is to return the remaining privately-owned lands in the north to rightful owners within the next three months. While vast extents of land have been returned to the original owners, State land is to be given to those who are landless and living in welfare centres or with friends and relatives. Responding to a question, he said that extremist Tamil elements were attempting to prevent any solution to the land issue. When the Government allotted land to the people, these elements had forced them not to accept the lands as they wanted the problems to continue since it would suit their ulterior motives, he said. When asked about demonstrations in the north, the President said he expected bigger protests during the UN Secretary General’s visit as there were elements with agendas. When asked about different positions of the Tamil National Alliance (TNA) and Chief Minister C.V. Wigneswaran, the President said that the Government wanted to bring all these elements with different postures in the north and south to an acceptable middle point and when the current policies continued with success, it would happen automatically. President Sirisena said that Sri Lanka should look at the global policies towards us with wise, rational and prudent manner. A Government Minister protesting in front of an international organisation is not the sane behaviour of a cultured nation, he pointed out. “During the hour-long bilateral discussion and the 10 minute one-on-one discussion with Ban Ki-moon, there was no mention about the UNHRC resolution,” the President answered when a journalist wanted to know if the Secretary General raised the issue of the UNHRC.